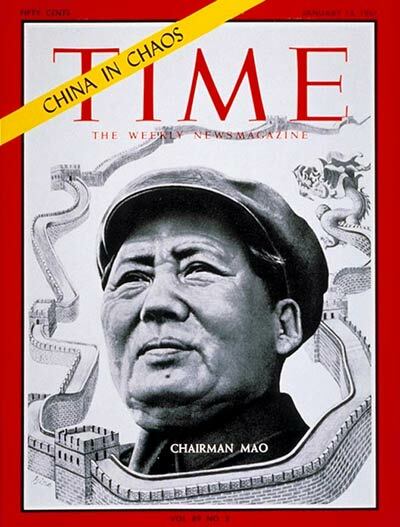 Chairman Mao in Time Magazine 13 1967, the height of his leftist phase. We all understand the conflict in the Middle East is a maze but to find a way through we must have guiding principles. Obviously Mao Tse-tung had none, he was simply an opportunist defender of the bureaucracy in China after he instituted that deformed workers’ state in 1952. His support for Pinochet alone on the basis of his absolutely bogus three worlds theory shows the poverty of his theory. He either never read Lenin and Bukharin (pre 1923) on Imperialism or completely failed to understand or decided to completely ignore it when he dubbed the USSR an equal and in practice a more dangerous imperialist power than the USA. Hence the alliances with Pinochet, Mobutu and Apartheid South Africa. These split every Maoist group in the planet and none now defend that theory, to my knowledge, but none make any real reassessment of it. Except that socialism in that single country Albania was the way forward. Cuba or Vietnam never seriously tried the internationalist world revolution stuff. Talk about painting yourself into an ideological corner. The recent efforts of comrade Dave Living Marxism, Hands Off Aleppo: Victory to the Syrian Revolution! Can only be described as hilarious as when he insisted in 20011 that Gaddafi was the real stooge of US imperialism in Libya even as the proxy jihadist army hired by the USA were murdering him. He is an object lesson on how to get everything totally wrong. Dave complains that the YPG/SDF collaborated with Assad in attacking the jihadist-helf eastern Aleppo (80% al-Nusra). As we shall see below the issue here is that the USA backs both the FSA, via the CIA and the YPG, via the Pentagon. Please try to keep up, Comrade Dave! No mincing words now. The USA is the hegemonic imperialist power; all other imperialist powers are its more or less willing allies. Neither China nor Russia are imperialist on Lenin’s famous 1916 criteria (Imperialism, the Highest Stage of Capitalism). And the main issue in Syria is the national rights of the Syrian nation and that is primarily defended by the Assad led Syrian government. This does not mean uncritical support for Assad or the methods he uses in this conflict; those of a corrupt bourgeois nationalist, but it does demand unconditional support against imperialism and their proxy clients in the region. We cannot grant any such critical but unconditional support to the YPG and Rojova whilst they remain clients of the USA. Inevitably they will come into more conflict with Assad and Russia. This does not mean we abandon support for the self determination of Kurdistan, but not on these terms. Given these we must take the greater global class struggle as our chief guiding principle. Similarly, we should have opposed the US sponsored coup against Erdoğan on 15 July unconditionally but critically. No support for his use of the crackdown not only to arrest and imprison the coup plotters (absolutely justified) but also to crackdown on the trade unions, the left and the Kurds (100% opposition). Of course Turkey and the FSA won on that one because priority now is to stop Erdoğan leaving NATO for the Russia China bloc. And the US project of a client Rojova with US bases to surround Russia and China must be postponed for now to secure this more pressing need in the preparation of WWIII. And Erdoğan plays that game of maneuver to his advantage. In all this ISIS and al-Nursa al-Qaeda, as was, also manoeuvre. Israel is important here as is Saudi Arabia. Israel does not simply want what the USA wants but to maintain conflicts in the region such that no serious power hegomonises the region to threaten its existence. Saudi Arabia wants to maintain Wahhabism to ward off threats of revolution to its own brutal semi-feudal rule. Clearly the USA and Russia and even Turkey are obliged to fight ISIS by public pressure and self-interest to an extent. No bourgeois democracy could be publicly seen to support so openly ferociously reactionary forces. Russia clearly began the serious assault on them, obliging the USA and Europe to follow. But Russia’s chief concern was defence of Syrian national sovereignty, a correct and progressive political aim, despite cynical motives of Putin. Therefore, the attacks of the Russian air force on ISIS, on the FSA and al-Qaeda were and are progressive because their aims are progressive. We would critically support them, observing that it is very far from a real revolutionary orientation, so desperately needed in the region. No support for US or other imperialist bombings of ISIS or anyone else here or anywhere else. We reject with contempt the bleeding hearts reports which present bloodied children victims of Russian or ISIS barbarism to cover the predatory aims of imperialism, the real imperialism that ensures poverty, starvation and unending wars for the profits of the global hegemon and its allies. And the million dead Iraqis from the 2003 invasion and the dead children in west Aleppo and all the other Syrian cities under government control, at least as many as under rebel control, get no mention. We all know about the fog of war but a simple Google will get you these statistics. These wars are all driven by the insatiable search for profits by the great finance houses of Wall Street and their associated transnational corporations. We should be absolutely certain on this point and not vacillate on it by attempting to find an equally culpable ‘Eastern Imperialism’ operating in the Middle East, in Latin America, South East Asia, Africa or anywhere else. Pledges to the Kurds to champion their right to self-determination and calling on them to reject their pro-imperialist leaders, Barzani, Talabani and Ocalan (ever mindful of the political differences between these three). Pledges to the Sunni civilians and all ethnic and religious minorities under both ISIS and the ‘rebels’ of religious and civil rights and no retalitory pogroms against them. The YPG are reported to have carries out such pogroms against Arab and other minorities in areas they have ‘liberated’. Guarantees of reversal of all neoliberal privatisations and corruption under Assad and his entourage. « Socialist Fight statement: defend Jackie Walker! The main military contest is between Assad and ISIS, is it not? (Or by “main issue” do you mean something besides the main _military_ issue?) Despite its origin, ISIS isn’t currently a U.S. military proxy. Or do you disagree? If this is correct, then how is Syria primarily a national struggle? The alternative, which you may reject but you haven’t done justice to, is that the struggle in Syria is primarily a sectarian war rather than a national war. You also claim that everyone’s against ISIS because it is just so reactionary that mass pressure so requires. A facile and incredible explanation.